There really is only one way we cook bacon. We bake bacon in the oven. 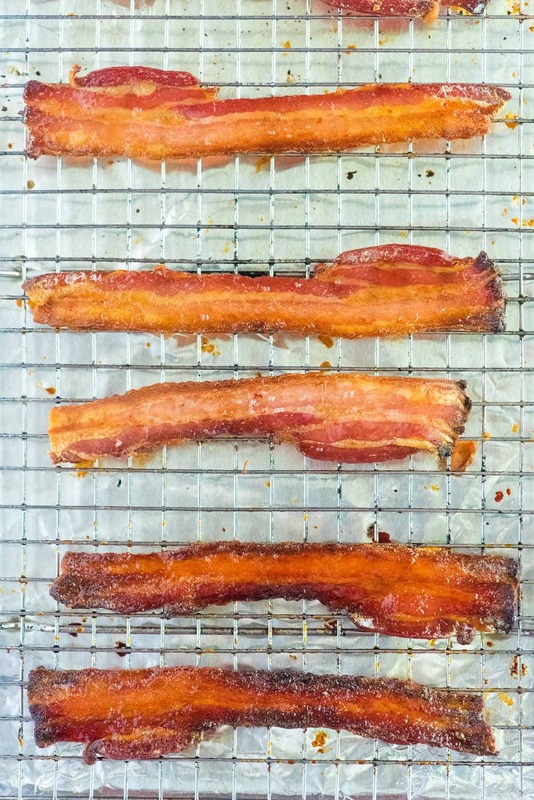 Jump to our recipe showing you How to Bake Bacon or read on to see our tips. Baking bacon in the oven is easy, there’s no spluttering of oil and it makes crispy slices of bacon heaven. 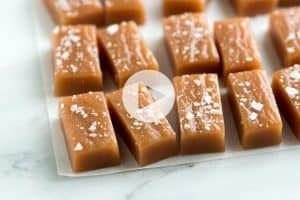 It’s also perfect for making big batches for a crowd! YOU MAY ALSO LIKE: How to make the best bacon wrapped shrimp with perfectly cooked shrimp and bacon that’s crisp. 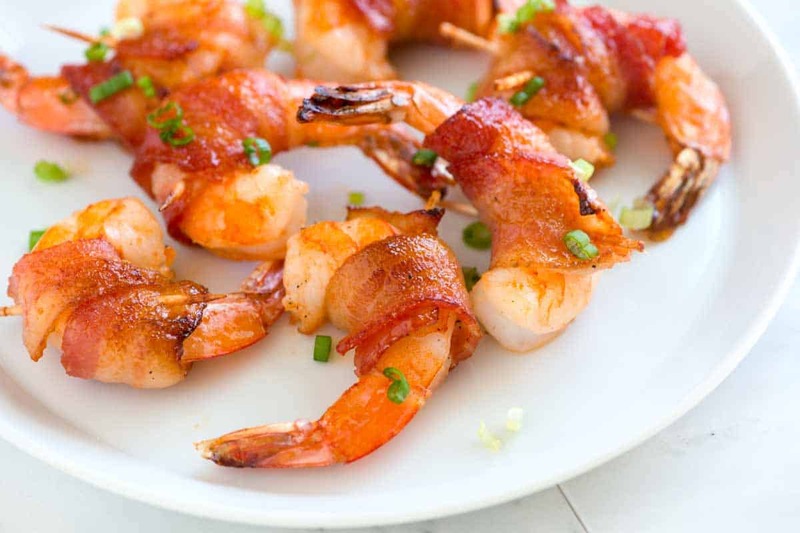 Jump to the Bacon Wrapped Shrimp Recipe. We love using a cooling rack that fits inside a rimmed baking sheet for this. If you don’t have a cooking rack that will fit inside a baking sheet, just line the baking sheet with aluminum foil or parchment paper and place the bacon slices directly onto the foil (make sure they are in one layer). The fat won’t drip away from the bacon, but it will crisp up nicely anyway. Equipment you will need: a rimmed baking sheet and a rack that fits inside. 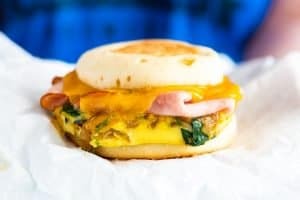 YOU MAY ALSO LIKE: Make the best breakfast and learn our tips for how to make scrambled eggs that are soft, creamy and delicious. 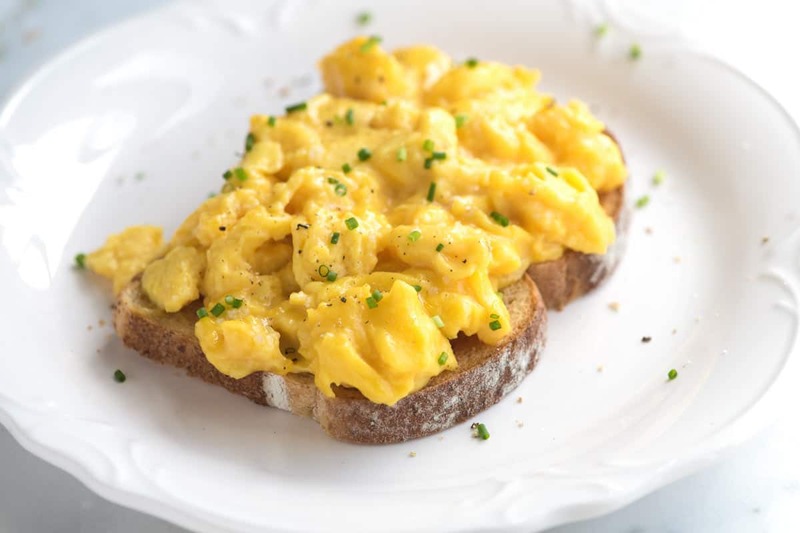 Jump to our Soft and Creamy Scrambled Eggs Recipe. For peppered bacon, grind fresh black pepper (we prefer a course grind) all over the bacon slices before or towards the end of baking. For maple baked bacon, bake for 12-15 minutes and remove from the oven. Brush maple syrup onto the bacon slices then place back into the oven for another 3-5 minutes until golden brown and crispy. For honey sriracha bacon, bake for 12-15 minutes and remove from the oven. Brush honey and sriracha onto the bacon slices then place back into the oven for another 3-5 minutes until golden brown and crispy. YOU MAY ALSO LIKE: Use up leftover bacon by adding it to this Easy Broccoli Salad! 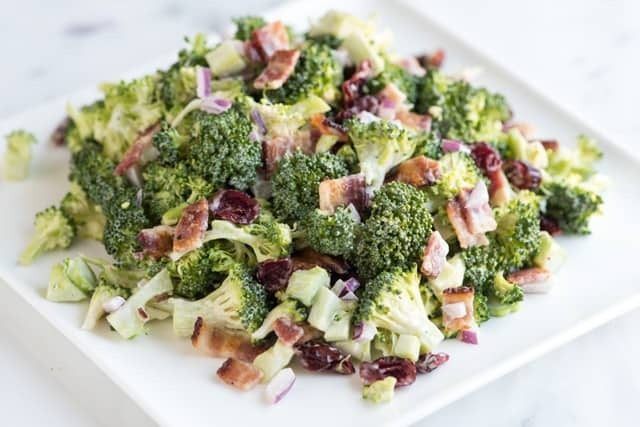 Crisp, green broccoli is tossed with bacon, cranberries, red onion and a zesty dressing. To bake bacon, you’ll need to start with a hot oven. If you have one, use a metal (oven-safe) rack inserted inside a baking sheet so that the bacon sits on top of the rack and any fat drains underneath. We prefer to use thick cut bacon (1/8-inch thick), which usually means there are 12 to 14 slices per pound. Position a rack in the middle of the oven. Heat the oven to 400 degrees F. If you’re cooking multiple sheets of bacon, position one oven rack in the lower third of the oven and the second rack in the top third of the oven. 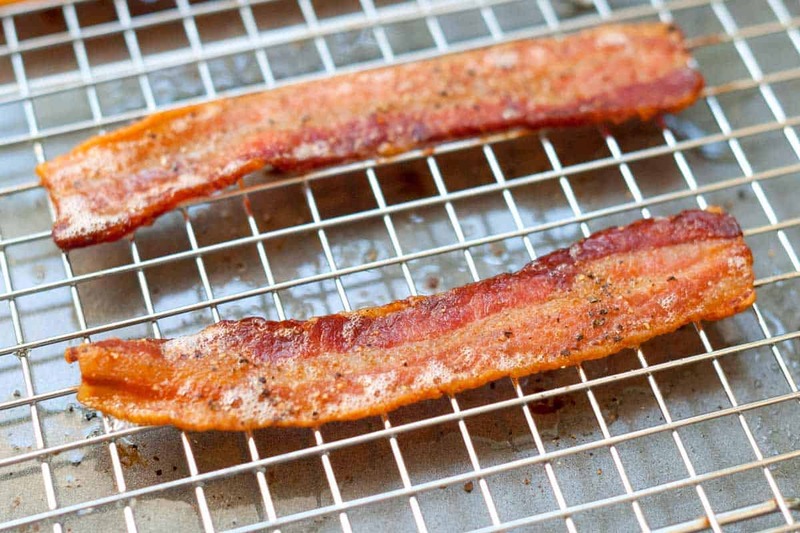 Arrange bacon slices onto a rimmed baking sheet lined with aluminum foil or parchment paper. 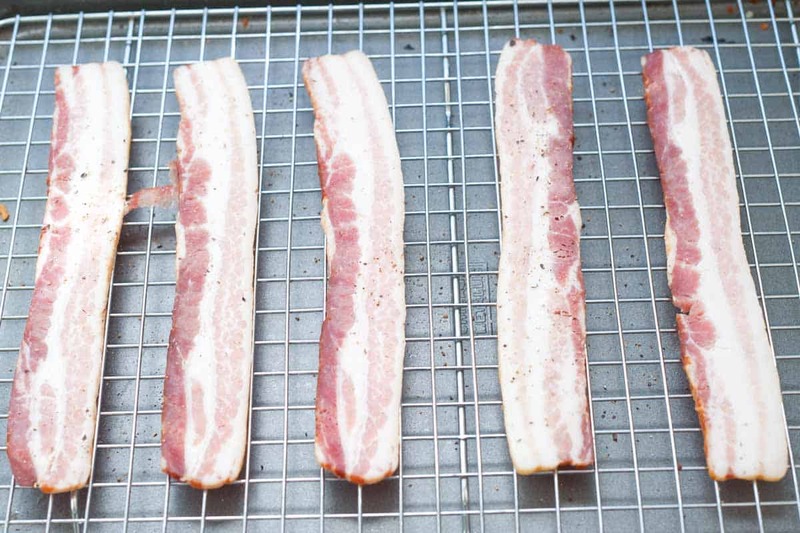 If you have one that fits, place a rack inside the baking sheet then arrange the bacon slices in one layer on top. Season with fresh ground pepper. Bake until the bacon is golden brown and crispy, 12 to 20 minutes. The exact baking time will depend on the how thick your bacon is and how crisp you like it. Keep an eye on the bacon while it bakes — we like to check around 8 minutes and then every minute or two after until it is done. Thin cut / Lean Bacon: If you have very thin cuts of bacon or if it is lean, you may not need to use the rack. Simply lining them up on the baking sheet should suffice. Thicker cuts of bacon benefit from the rack since it lifts them up and away from the fat, helping them render more fat and become crisp. For maple baked bacon, bake for 12-15 minutes and remove from the oven. Brush maple syrup onto the bacon slices then place back into the oven for another 3-5 minutes until golden brown and crispy. Watch for over-browning of the maple. It goes from caramelized to dark brown quickly. For honey sriracha bacon, bake for 12-15 minutes and remove from the oven. Brush honey and sriracha onto the bacon slices then place back into the oven for another 3-5 minutes until golden brown and crispy. Watch for over-browning of the honey. It goes from caramelized to dark brown quickly. Nutrition facts: The nutrition facts provided below are estimates and assumes about 14 slices of bacon equals 1 pound. We have used the USDA Supertracker recipe calculator to calculate approximate values. This was the best bacon I have EVER had! Every piece was perfect. This is so easy and with no mess. Thank you very much. Absolutely perfect. Don’t know why I didn’t think to do this sooner. Tasted better then pan frying it. I was able to make 12 pieces Snd didn’t have to miss out on breakfast because I was making 4-5 pieces at a time. This will be my new method for bacon every time now. Thank you ! Excellent! We like ours crispy so it took almost 40 minutes at 400°. We all thought it was delicious! Over the years, I’ve cooked bacon every way possible. Not sure why some cooks prefer the oven over the microwave? One thing is for sure, fresh bacon is built for the microwave. 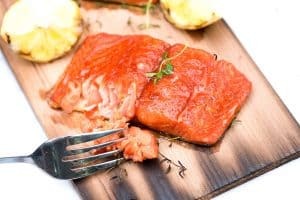 It has a high fat and water content and it is thin, so it cooks up crisp and tasty. Take a look at the Bacon Pro for cooking 23 slices. Make the best oven bacon ever by adding Montreal Steak Seasoning. Always used the oven method its great. Cooling rack even better for draining oil no more paper towel dabbing after done! Now how to make rack easy to clean up after?? Ideas? Hi there, a quick spray of nonstick cooking spray can help. We also have a rack devoted to this type of cooking (we bake chicken wings the same way). Not to be dense but… I ended up with so much grease in the baking sheet that there was no way of safely removing it from the oven until it completely cooled down. Any suggestions? PS: The bacon itself did rule, once I finally got it out an hour later. Hi Eliza, did you use a rimmed baking sheet? This is best when baking bacon. Eliza, discarding the bacon grease is best done with lining the bottom of the rimmed sheet with aluminum foil. And yes, you need to let it cool to a safe temperature before you gather it up and discard it (or save it). IMHO, baking your bacon is the way to go. It’s pretty foolproof. Ideally, you should have another dish, bread, French toast to pop in the oven to take advantage of the hot oven, but it somewhat minor. Absolutely amazing, I love cooking bacon now.my Family loves it.. If you use parchment paper instead of foil-no spatters in your oven! …What’s the temp on the oven…? The bacon bakes at 400 degrees F.
Yes! I’ m not very kitchen savvy, and my bacon usually ends up “extra crispy”. But everyone loved my bacon this morning. The cooling rack is genious! 5 stars definitely.Thank you. I think cooking bacon in the oven is the best method, because the both sides of the bacon strips are heated relatively equally in this method. You will get more delicious bacon without have to dirt your stove badly. We love to make bacon in the oven. I sprinkle a little sugar on top of the bacon slices before I put the bacon in the oven. You get both sweet and salty bacon. Great combination. Fantastic post. That’s exactly what I was looking for. this is the only way I’ve cooked bacon for years. So easy and less mess. Usually save some of the bacon grease for future use. 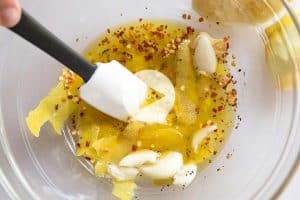 Your Recipes and Pictures look simply delicious. Thanks! and Cheers! My mouth just fell off my face in a river of drool. P.S. Thanks for linking back to my cupcakes guys! Jessica – You should definitely make bacon more often!